The Eurocard rack mechanical standard has a 2.54mm (0.2 inch) gap between the front vertical edge of the PCB and the back face of the front panel. I have no idea why this is so and I question if it is necessary. It is a real pain when designing PCBs with controls that are on the PCB but are also attached to the front panel. You either use a standard footprint and accept that part of the silk screen will be off the board ( and have to tell the PCB fab house it is OK when the inevitably query it) or make special footprints just for this purpose. Also, the die castings are expensive and waste a lot of front panel space. 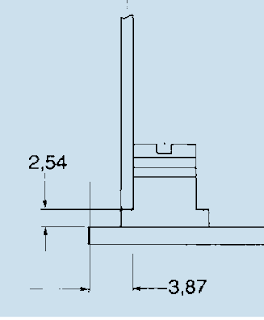 The interesting thing is if you fit one to a PCB is protrudes by 2.24mm so it very nearly meets the standard (it is 0.3 mm = 7.62 mil short) but of course it does not have the shoulder the die casting has so the PCB sort of flaps in the wind. So it occurred to me all I would need do is make the PCB 2.24mm longer and the PCB front edge would be flush with the front panel. So I could use these cheaper fixings and not have to worry any more about PCB footprints. The question remains; why does the Eurorack standard have this 2.54mm gap in the first place? Have I missed something? The question remains; why does the Eurorack standard have this 2.54mm gap in the first place? Have I missed something? This gap is used by label holder and/or card locker/extractor when euro card is not hooked to front panel. Ah, that makes sense. So there is no reason to retain it if I do have a front panel and I don't use labels or an extraxtor. So there is no reason to retain it. Sticking to the standard let the compatibilities, especially the ones you don't thing about today. Extending to 100x162.54 won't hurt for your use case as I see it now. OK, I had not seen a label holder like that before. As you say, not an issue for my use case. Yes it reminds me of the cards in a Studer B67 I once had but that was long before I got into Eurorack mechanics. Ooooh. Do I get a prize? LOL. I had a B67 15 years ago.I rarely if ever had cause to remove a card so the fact it had a label holder would not have been remembered. And I had no idea it was part of the current Eurorack standard. I am not sure if any of the current manufacturers literature even mentions it. And I had no idea it was part of the current Eurorack standard. I am not sure if any of the current manufacturers literature even mentions it. Neither I know, your initial question just light my mind and I correlate with those plastic part I have all around at my eurocards rack. Not surprisingly, that had occurred to me, but I can see no way of expressing the unique cadence of the announcer in writing. Chokes: How to do the Gap right?